I had a great Thanksgiving week surrounded by friends who are like family. We went to the library and picked out books, played football outside, went to a College basketball game, cooked a lot of food, played tons of boardgames, and watched a few Christmas movies. I was able to finish The Picture of Dorian Gray, Supernatural Tales, and started reading Welcome to the Show. I am counting all those toward #thankfullyreading, #csreadathon, and the 75 BOOKS (Goodreads group) Thanksgiving readathon. The #csreadathon is actually part of the Christmas Spirit Reading Challenge, which runs through January 6. There are different levels to reach and I am well on my way to get to Christmas tree! The #tistheseasonathon just ended last night and I am happy to report I was able to fulfill all their categories! I am currently finishing up Magician: Apprentice which will mark book #6 for #csreadathon and also fulfills a Popsugar reading challenge. I am also listening to In Cold Blood. How are you guys faring? Are you doing any reading challenges this month? I have two more upcoming: #magicalreadathon2018 organized by Book Roast and #shortathon18 hosted by Howling Libraries. Look out for updates for these on my blog and on my Twitter. This will be my blog post with a running list of all the Christmas-themed goodness I’ll be participating in. I love Halloween because it soothes my soul. I love Christmas because it has my heart. I wish I could take October through December off every year and just read books, books, and more books. I know Thanksgiving is still in between but I just can’t wait for Christmas. I enjoy the foodie experience for Thanksgiving but there is so much more to do for Halloween and Christmas. If you read my blog regularly, you know I participated in multiple Halloween-y readathons and generally devour horror books, so it comes as no surprise that I also need to partake in Christmas reading challenges. What is surprising is that I rarely read holiday type books. I am going to change that this year! The readathons below are organized by start day and theme. This list is, of course, ever evolving. 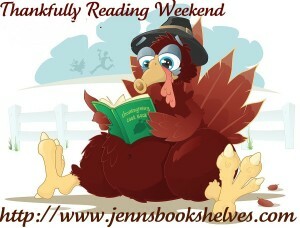 In my mind, this is a let’s be thankful for books readathon that runs November 21 – 25. It’s free-form aka read what you want with the goal to cheer each other on (use #thankfullyreading on Twitter and Instagram). I am hoping to make good headway with my current reads and to finish 4 more books toward my Popsugar reading challenge by the end of November, thus I will probably focus on those reads during Thanksgiving. I also always read with my friends’ kids. They visit me every year and we make a special trip to the library to pick out books to read together. Follow me on here or on my Twitter during this readathon. Seasons of Readings has quickly become my favorite resource for seasonal readathons. It’s a sweet group experience with lots of chats on Facebook and Twitter. This readathon takes place November 19 through December 2 and kicks of the longer Christmas reading challenge for which I noted down some of the categories! Let’s put it that way, I hope to level up to Christmas tree! The actual challenge runs November 19 through January 6 and I’ve started to compile potential reads. Be sure to check my progress on here and on my Twitter (#csreadathon). A few fine Booktubers and Bookbloggers are hosting this lovely readathon that even features specific prompts. Prompts make my heart grow two sizes because there basically is nothing better than checking off something I’ve done. This readathon runs December 3 through 9. I’ll be updating my progress here on the blog or on my Twitter account (#tistheseasonathon) and yes, my book list, per ush, is subject to change. I have a few more books left that I want to read this year and I will try to match them to these prompts. I will also double dip between readathons. A book with a red or green cover. There are two Mary and Carol Higgins Clark books on my list that fit this category: Deck the Halls or The Christmas Thief. Read a book while listening to Christmas music. I know this book is set during the fall (or so the synopsis says) but I think it would be a creepy but cozy read with holiday music: Let the Right One In by John Ajvide Lindqvist. Plus, I had already planned to read this one during December. A warm and fuzzy book. This screams romance novel to me, so I am most likely going to read this one: Christmas at the Comfort Food Cafe by Debbie Johnson. A short book (>200 pages). I have really stepped up my novella game this year and have come to love a good short story. I think I will read Skipping Christmas by John Grisham for this. A holiday-themed book. Again, I am kinda using these prompts to read a bunch of fluff romance novels. The Gift by Cecilia Ahern definitely fits the bill. bonus: group read of Snow in Love (various authors). This one looks promising. I hope I’ll get to it. Book Roast is hosting yet again another Magical Readathon. She usually has lovely challenges but I specifically love this one: it’s sort of a choose your own adventure/path! This readathon runs from December 17 through 26 with the goal to Attend the Christmas Feast. Book Roast is very active on her Twitter, so be sure to check that out and follow the official hashtag #magicalfeast2018. I’ll be updating here on the blog and also on my Twitter. Here is a quick preview of the reading prompts. I can’t wait to carve out my path! My plan of attack for this is to just go with the flow. I am not going to pre-plan which path I’ll take. I’ll see what books on my shelf, on my Kindle, or in the library strike me fancy and if they would allow me to advance to the next step! What are your reading plans for the holidays? Are you participating in any fun readathons? and Something Wicked This Way Comes. I’ve linked to my Goodreads reviews or you can read my monthly wrap-up here on the blog. I think next year I am going to be a bit more prepared for these readathons. I ordered a bunch of books that I’ve been meaning to (re)read and would like to own but they didn’t come in on time. That won’t happen again! Well, here we are. Dewey’s 24-hour readathon is over. Time went by soooooooo fast! I struggled a lot this time. I was constantly sleepy despite my multiple coffees. I read very slowly averaging only 27.1 pages per hours read; which is super duper low for me. My most accomplished hour was 66 pages in a Goosebumps book. I am a little disappointed, to be honest, but I am trying to not be too harsh on myself. I do want to celebrate this day! I read! I am celebrating that! My time spent with books over the past two months has been minimal and this readathon kicked me back in gear. I also enjoyed my 4 hours of social media moderating in our Goodreads group, on Twitter, and on the Dewey’s blog. I had some really awesome conversations and got a ton of new book suggestions! 1. Which hour was most daunting for you? All of them this time. 2. Tell us ALLLLL the books you read! I finished The Bloody Chamber and Welcome to Dead House. I made it about 2/3 through Pride and Prejudice and Zombies. I read about 20 pages of The Picture of Dorian Gray. And I listened to almost 4 hours of Neil Gaiman reading Fragile Things. 3. Which books would you recommend to other Read-a-thoners? Definitely The Bloody Chamber. What a lovely collection of dark and creepy adaptations of fairytales. 4. What’s a really rad thing we could do during the next Read-a-thon that would make you happy? Just continue to be your awesome selves! 5. How likely are you to participate in the Read-a-thon again? Would you be interested in volunteering to help organize and prep? P(participate in April 2019) = 1. I’ve volunteered in the past (writing warm-up posts, hosting on the blog or on Twitter) and would love to get even more involved. How did you guys fare? What did you read? How is it going? How are you holding up? I’ve had the hardest time this readathon. I feel like I’ve been sleepy right from the beginning despite the fact that I am continuously pumping myself full of caffeine and food and water. I’ve had a few interruptions too but all in all, I made decent progress. I was able to finish The Bloody Chamber and get about 2/3 through Pride and Prejudice and Zombies before “having” to take a social media timeout. I hosted hours 14 and 15 in our Dewey’s Goodreads group and am in the midst of keeping an eye on the official blog and tweeting my heart out @readathon (hours 16 and 17). I do really love interacting with everyone on Twitter. While I am doing that I’m being serenaded by Neil Gaiman reading Fragile Things and I gotta say his voice is just so soothing. For the rest of the readathon, I am planning to finish Pride and Prejudice and Zombies and read a few Goosebumps books. I also have the third volume of The Sandman series at the ready. I hope I get to that as well. Hour 1 – it has begun! I hope everyone is bright-eyed and bushy tailed. Because I am not. Mornings are not my thing but what wouldn’t I do for books?! I am still in PJs with coffee in hand. I am going to start my readathon with tales from The Bloody Chamber. Here is my book stack for today! I’ve also always wanted to read books from the Goosebumps series, so I have a few to choose from that as well. Books on my Kindle include The Picture of Dorian Gray (Oscar Wilde), Year One (Nora Roberts), From a Buick 8 (Stephen King), and a bunch of others that don’t fit the theme but definitely could be read if the mood strikes. What is your first book? Do you have any traditions to start the readathon off with? Bookish peeps, it finally is that time again: Dewey’s readathon! I am so looking forward to this weekend – Saturday (Oct 20th) will be spent reading, eating, blogging, and being utterly happy. September and October have been a pretty bad struggle bus for me. I have read very little, I am late on any of my blogs, and I have been overall pretty detached from my books and book clubs. All this will change this weekend. I am going to use the readathon to find my way back to my lovelies. With it being fall and nearly Halloween, and with me (technically) participating in a few other spooky themed readathons, I will focus on reading only the creepy, the weird, the odd, and the dubious. I have a plethora of Goosebumps books to choose from. I could finish The Picture of Dorian Gray (Popsugar category) or Salt (an ARC). Planet of the Apes … . Every other book I forgot to think of. Just writing out this list of potentials gets me even more pumped for Saturday. Now, I just need to think of my snacks. I already picked out my reading nook in the new house and hope I will have lots of virtual reading dates with each and every one of you. P.S. : Maybe I will manage to take some pictures of my TBR for the blog. I am still waiting on a few library copies to come through.